Will you be remembered for charitable giving and philanthropy? Plan a Maryland Food Bank bequest and ensure a legacy of impact. 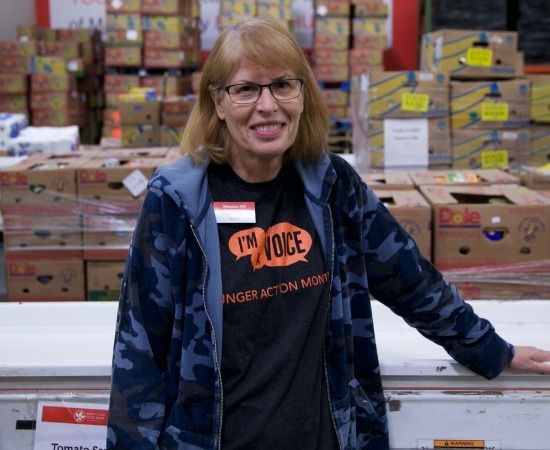 When Ann Miller founded the Maryland Food Bank in 1979, she thought we’d only need five years to end hunger in Maryland. She continued to fight for that goal until her passing in 2013 at the age of 97, touching countless lives along the way. The Ann Miller Legacy Society recognizes those who, like Ann, choose to leave a lasting impact on hunger in Maryland through a legacy bequest to the Maryland Food Bank. Your legacy gift — whether in your will or another part of your estate — ensures your assets are put to the best philanthropic use and distributed in a way that reflects your beliefs and values. Some giving options provide current or future tax benefits to you or your estate, and some can provide lifetime income to you or your family. No matter how you give, you’ll continue to impact the lives of hungry Marylanders. Like Ann Miller, you have a vision of a better Maryland. Plan your gift now to help make that vision a reality. By donating your retirement plan assets (such as an IRA or 401k) to the Maryland Food Bank, you can reduce income and estate taxes, while making a meaningful gift to help fight hunger. Contact the administrator of your retirement plan to complete a beneficiary designation form. These forms can be updated at any time without the legal steps needed to execute a will. To learn more about giving to Maryland Food Bank from a retirement plan, contact our Philanthropy Department at (410) 737-8282 x202 or via email. To learn more about bequest giving to Maryland Food Bank, contact our Philanthropy Department at (410) 737-8282 x202 or via email. If you own a life insurance policy that you no longer need, you can consider a revision to your beneficiary designation form to name the Maryland Food Bank as the sole owner and beneficiary of the policy. You will receive an income tax deduction for the cash surrender value of the policy. If the policy is not fully paid, you can consider continuing to pay the premiums – and, in doing so, you will receive a charitable contribution deduction for the annual premium amount. Some donors use the tax savings to replace the life insurance with other assets that will be distributed at death to family members as part of their inheritance. To learn more about designating a life insurance policy to Maryland Food Bank, contact our Philanthropy Department at (410) 737-8282 x202 or via email. For younger donors, a deferred gift annuity offers increased income tax benefits. All of the features and benefits of a gift annuity are provided with a deferred gift annuity — but, the actual distribution of the income is delayed until a future date, chosen at the time the gift is created. The longer the time between the creation of a deferred gift annuity and the start of the payments, the greater the rate of return and the larger the income tax charitable deduction. To learn more about giving to Maryland Food Bank through a Deferred Gift Annuity, contact our Philanthropy Department at (410) 737-8282 x202 or via email. A charitable lead trust is a creative way to use some of your assets to fund annual gifts for your favorite charity (the Maryland Food Bank) for a period of years, or for your lifetime. At the conclusion of this period, the assets in the trust are distributed either back to you or to beneficiaries you name, often children or grandchildren. Besides the opportunity to make a substantial charitable gift, another advantage of this kind of trust is the opportunity it offers to pass substantial assets to a next generation with little or even no tax consequences. A charitable lead trust is a creative way to fulfill a gift or pledge over a number of years while reducing estate and gift taxes that might otherwise be due on the trust assets if given outright to children, grandchildren, or other loved ones. To learn more about establishing a Charitable Lead Trust to benefit both the Maryland Food Bank and your loved ones, contact our Philanthropy Department at (410) 737-8282 x202 or via email. If you have included The Maryland Food Bank in your estate plans, please let us know by returning the Planned Gift Intention form. We would like to thank you for your generous commitment and acknowledge your intention to make a bequest gift in our Annual Report. You make it so it’s not shameful (for people in need) to get food assistance… Instead of giving $5 to $10 to random charities here and there, pick a charity to become your charity. The Maryland Food Bank is my charity. The food bank is near and dear to my heart. I’ve been volunteering since 2005, and I enjoy the results of my work there, knowing that others benefit from it. I am fortunate enough to be able to be able to afford retirement and decided that I wanted the food bank to get a portion of my and my wife’s estate. To learn more about planned giving to Maryland Food Bank, contact Chris Maynard at (410) 737-8282 or via email. The Maryland Food Bank provides general information only and does not provide financial counseling or estate planning services. For tax or legal advice, please consult a professional financial advisor or an attorney.